MANILA -- President Rodrigo Duterte on Sunday expressed his sympathies to families who lost their loved ones during the onslaught of Typhoon Ompong. “I share the grief of those who lost loved ones,” Duterte said in a situation briefing on the effects of "Ompong" in Tuguegarao City. “Those we call in the unforeseen events, in insurance, this is an act of God. I don’t know how it can be an act of God but that is the term used by the insurance,” he added. Presidential Adviser on Political Affairs Francis Tolentino said at least 25 people died at the height of the typhoon, many of them due to landslides. 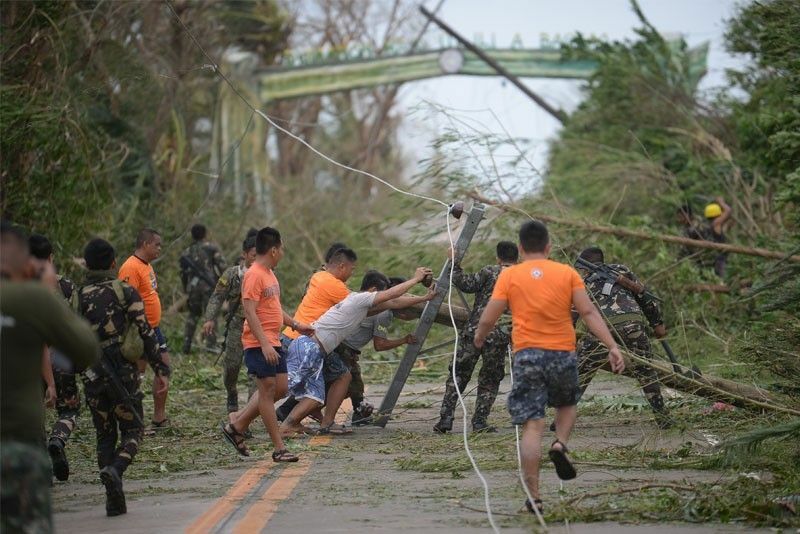 Despite the casualties, Tolentino reported to the President that the readiness of all the local government units (LGUs) has reduced the impact of the typhoon that hit northern Luzon last Saturday. Tolentino was designated by Duterte as his point person during "Ompong". The President commended all national and LGU officials, including his Cabinet men from Luzon whom he sent to the provinces of Cagayan and Isabela to personally monitor the typhoon. Duterte assured Filipinos that the government is present in every calamity. He directed all concerned government agencies to make sure that normalcy is restored “as soon as possible” by starting immediately all rehabilitation and repair works in the areas hardest hit by "Ompong". Duterte also instructed his Cabinet men to attend to damaged public utilities, particularly those on electricity and water, as well as bridges. National Disaster Risk Reduction and Management Council (NDRRMC) Chairman and Defense Secretary Delfin Lorenzana said the council has a balance of PHP2.3 billion and some PHP13 billion from the contingency fund that requires the President’s approval for typhoon-affected areas. “Just make sure that there is no corruption,” Duterte reminded his officials. “We’ll follow the rules how to spend the remaining money to help the residences." Tugade, who monitored the typhoon in his home province of Cagayan, reported that damage to transportation infrastructure is minimal at PHP30 million to PHP35 million. He said the Civil Aviation Authority of the Philippines (CAAP) office, as well as the X-ray machines of Tuguegarao City airport, were damaged by the typhoon. This prompted the President to instruct Tugade to purchase reserve X-ray machines, particularly for domestic airports, to avoid delays on the part of the passengers during natural and man-made calamities. “The X-ray machine is (a) very critical component of security. So why don’t you have three to four reserve for domestic (airports)?” Duterte said. Tugade lauded the President’s decision to send them to the provinces, saying the move inspired LGU officials to work hard during the preparations for “Ompong”. “It was the time that I said Cabinet members should be here, especially those who came from here,” he added. Tugade said he noticed that Duterte’s decision to hold a command conference before "Ompong" last Friday has triggered a flood of support not only from the LGUs but from the private sector, particularly the business industry, as well. Meanwhile, Department of Social and Welfare and Development (DSWD) Acting Secretary Virginia Orogo assured enough supplies of relief goods for typhoon-hit areas. “Our regional office has prepared PHP2.2 million worth of rice and canned goods,” Orogo said in a separate press briefing moderated by Presidential Spokesperson Harry Roque. From Tuguegarao, Duterte proceeded to Ilocos Norte to also check the damage left behind by the typhoon.